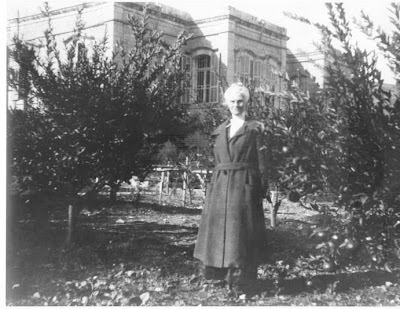 Ninety-three years ago, on April 1, 1916, Abdu'l-Bahá dictated one of the Tablets of the Divine Plan to the Western States. Here is a photograph of that original Tablet. (These images were obtained from the U.S. National Baha'i Archives. The Archivist, Mr. Dahl, said that the National Spiritual Assembly has stated that they can be shared freely with the friends. When you copy these images and share them with others, please include the photo credit: "Courtesy, Baha'i National Archives, Wilmette.") Please click on the images for larger photographs. This is not the famous Tablet that contains the Prayer for the Western States; our Archives does not possess that original Tablet, which was revealed in 1917. 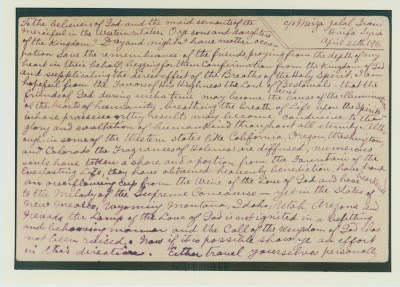 This is the earlier Tablet to the Western States, revealed in 1916. This was during the First World War, and all mail was subject to government censorship. Perhaps to assure the government censor that there was nothing secret in the Tablet, and to speed it through the process, the Master directed that the Tablet be sent to the United States on a postcard. 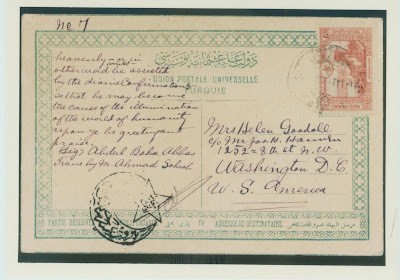 First, a photograph of the Tablet, as it was revealed in Persian by the Master, in the handwriting of the secretary to whom He dictated it, written on both sides of one postcard. 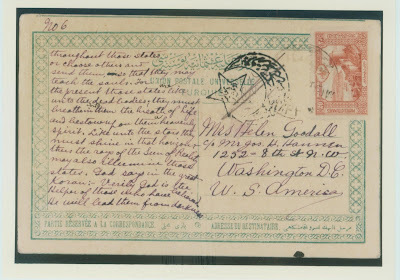 The Tablet/ postcard is addressed to an eminent early believer who resided in Oakland, Mrs. Helen Goodall, c/o Joseph Hannen, another eminent believer, who resided in Washington D.C.
Abdu'l-Baha writes His own name humbly, in small letters; and the “B” for “Baha” gloriously written, capitalized, and in beautiful script. I would like to add a note about the secretary to whom the Master dictated the Tablets of the Divine Plan, and who translated them into English, Mirza Ahmad Sohrab. This is not the first time that an important Tablet is in the handwriting of a secretary who later broke the Covenant, and of course this does not affect the holiness of the Tablet; its holiness comes from its Author. Similarly, a great number of Baha'u'llah's Tablets are in the handwriting of his amenuensis, Mirza Aqa Jan, who broke the Covenant after the Ascension of Baha'u'llah. More extraordinary still that he who had been instrumental in carrying the Tablets of the Divine Plan from the One Who had revealed them to those into whose care they were to be committed, who had enjoyed, for so long and so intimately, near access to his Master as amanuensis, companion and interpreter, should have been blinded by his inordinate ambition, and should have arisen, with all the resources at his disposal, to attack and undermine the institutions of an Order which, springing from the authentic Will of Abdu'l-Bahá, had been designed by Him to be the chief instrument for the vigorous prosecution of that Plan and the fulfillment of its ultimate purpose. 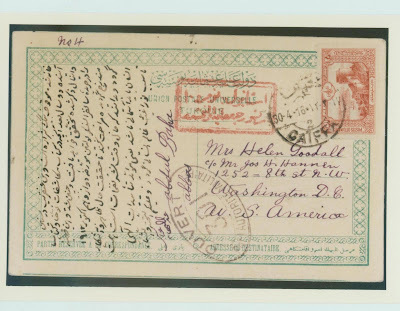 The return address on the postcard is “c/o Mirza Jalal Irani, Haifa, Syria”. Mirza Jalal was one of the Master's sons-in-law, married to His daughter Ruha. He lived in Haifa, and was engaged in business. 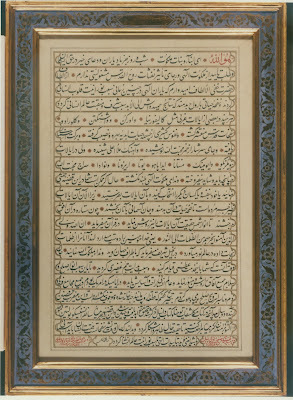 The following is is the same Tablet, in Persian, rendered into beautiful calligraphy by Nuri'd-Din, one of Abdu'l-Baha's secretaries. He was one of the sons of Zaynu'l-Muqarribin, the eminent scribe who mentioned in Memorials of the Faithful, p. 150, and in the Introduction to the Most Holy Book, p. 9. 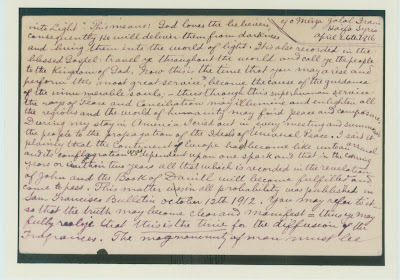 At the bottom left corner and bottom right corner there is writing in red script, and together these two phrases say: "This is a blessed Tablet revealed Saturday morning, April 1, 1916, at Bahji in honor of the friends of the eleven Western States of the United States of America." 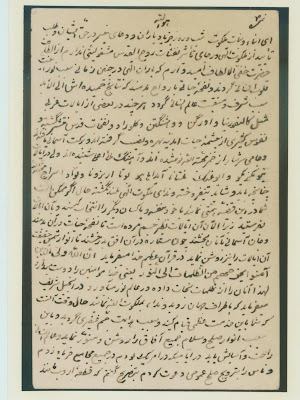 The calligraphy is signed by Nuri'd-Din. Next to the red portion in the bottom left corner is the Master's original signature in His own hand, in black ink. So, as seen above, the Master signed the Tablet in Persian that was sent by postcard, and He also signed the magnificent calligraphic version of this same Tablet. There may be deemed to be two “originals” of this Tablet – one in Sohrab's hand, signed by the Master; the other in Nuri'din's calligraphy, signed by the Master and brought from the Holy Land at a later time. Thank you Brent! This will really add a special dimension when we meet as a community on Sunday to read some of the Tablets to mark the 100th anniversary.